40mm: Because of the increasing popularity of this scale, we've concentrated on producing a number of ranges spanning military history. Future ranges will include more ancients, medievals, British colonials, and more American Wars. In order to provide the greatest versatility and variety, most figures have separate heads and some may require assembly. 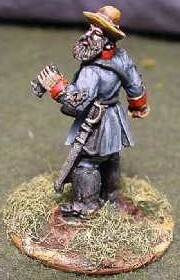 The figures have been designed with both the wargamer and diorama maker in mind. 25mm: We've attempted to produce historically accurate figures in poses that are period appropriate and, whenever possible, taken from historic drill manuals.